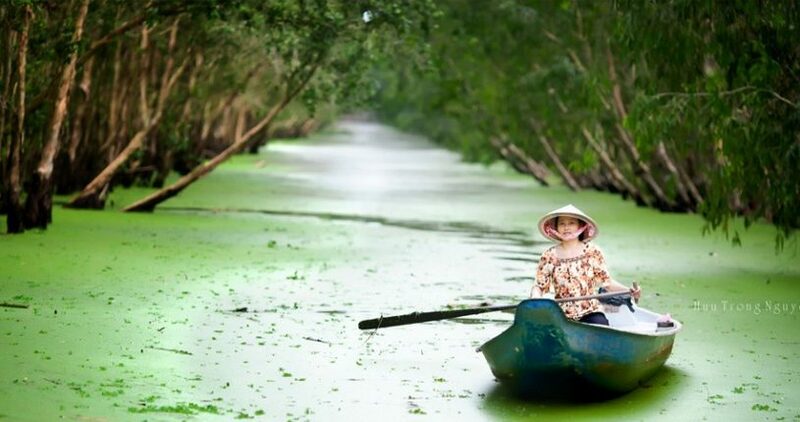 An Giang is one of the major tourist destinations of the Southwestern Vietnam. 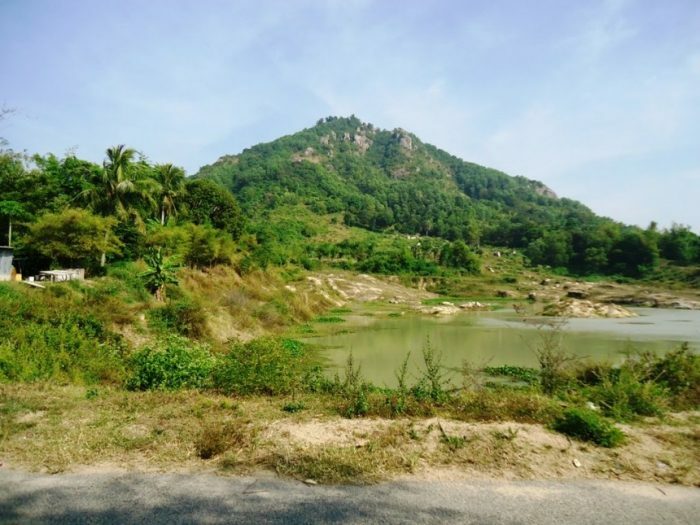 In addition to popular landmarks such as Ba Chua Xu Temple, Thoai Ngoc Hau Tomb, Tay An Ancient Village, Cham Village…, there are many breathtaking attractions that are still unknown to tourists, such as Binh Thien lake, Tra Su melaleuca forest, Ba The Mountain. Tra Su melaleuca forest: it is located in Tinh Bien district, An Giang province, nearly 100km from Long Xuyen city. This place has a rich and varied flora and fauna ecosystem. In addition to the precious medicinal plants, it is also home to more than 70 species of rare birds such as 26 species of sparrows, birds, bats, including two species in the Red Book of Vietnam, which are Indian storks and Anhinga melanogasters. Tra Su melaleuca forest is considered as a world of green from water-ferns, leaves, and clouds. The water-ferns shook by the paddle drift to two sides and then quickly return to the old position. Occasionally, visitors can hear the sound of nature and birds in the middle of the green forest. Visitors seem to be lost in the land of fairy with the “green party” of nature plus the wild sound. It is a waste of a trip to the Southwest and An Giang without visiting melaleuca forest. This is not only the most prominent place to show the culture of this land but also an attraction to many researchers and visitors. 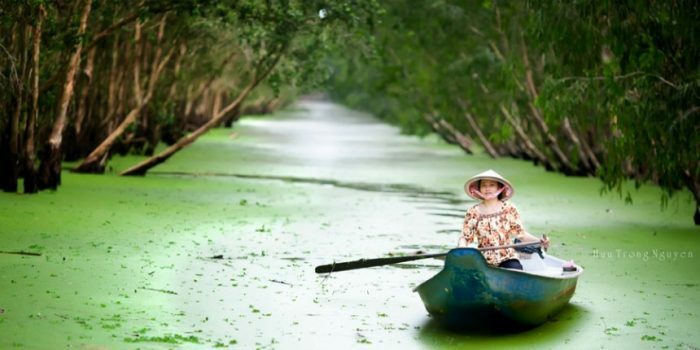 Tra Su melaleuca forest is a symbolic beauty of Mekong Delta in the flooding seasons, worth visiting once in a lifetime. Ta Pag mountain and lake: Located about 1 kilometer from the center of Tri Ton town, Ta Pa mountain brings wild and mysterious beauty. At the height of less than 200 meters, there is a large Khmer temple and a lake surrounded by cliffs. At the top of the mountain, Ta Pa lake is like a deep hole with green jade water. It is a remnant of the stone mining process, with a warning of up to 17m in depth. Even though it was accidentally created, it has become a fascinating landscape to many visitors. Ta Pa lake is surrounded by rocky cliffs from the top to the bottom. The water appears a jade color and flat like a mirror in the blue sky, which always attract tourists. 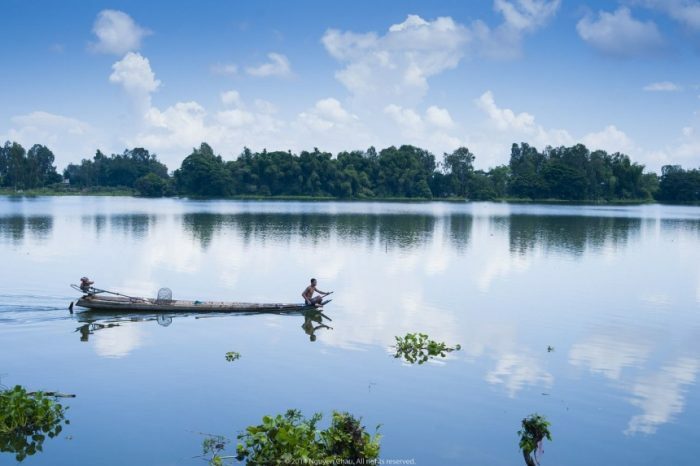 Binh Thien lake: About 30 km from Chau Doc, Bung Binh Thien is also known as the lake of the sky, located in An Phu district, An Giang province, close to the Cambodian border. It is very beautiful in the flooding seasons with yellow Sesbania sesban among green hyacinths. The Cham village around the lake bank remains the ancient cultural values. Ta Pa Field: Located in Tri Ton district, Ta Pa Field is like a large carpet with green rice fields and palm trees in the blue sky. Watching from the sky, Ta Pa is seem to be a green carpet of rice, scattered by the high pitched Jaggery. Ba The Mountain: Ba The Mountain is also called Vien The or Hoa The. Beautiful scenery in Ba The mountain is considered as heaven. There are many stories and myths about this mountain communicated by An Giang people. The ancient temple named Son Tien Tu at the top of the mountain is a stop of many visitors. In the early morning or freezing days, the mountain is covered by hovering clouds, cool mist, green plants, bird songs, and echoing sound of the temple bell. It is considered as the real paradise by tourists since they catch this moment. Forbidden Mountain: Forbidden Mountain is located in An Hao Commune, Tinh Bien District, An Giang Province with an altitude of about 710m above sea level, also known as Thien Cam Mountain. This is the highest mountain of the spectacular mountainous area and a unique region of An Giang province and Mekong Delta in general. 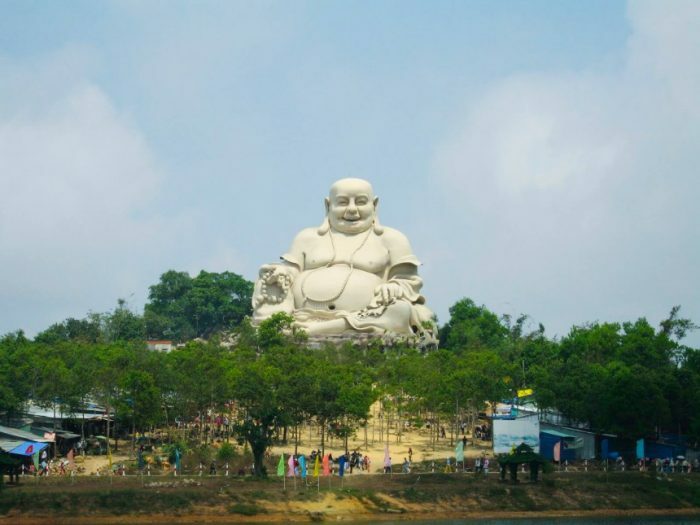 Particularly, at the peak of Forbidden Mountain, there are religious structures of Maitreya Buddha of 33.6 meters in height, Van Linh Pagoda, Big Buddha Pagoda and many interesting sights such as lake, streams, caves, primitive forests and so on. If you intend to visit the Southwest of Vietnam, do not hesitate to choose one of these above attractions on your destination. Do not forget to travel with Daily Travel VietNam in 3 days 2 nights or 4 days 3 nights tour to Chau Doc – – Can Tho. Contact us via (+84) 0164 3834 069 or (+84) 908 44 00 58. Have a great trip with lots of fun.